Corey Crawford is to Michael Leighton, as Mikkel Boedker is to Patrick Kane. It’s hard to tell whether Crawford was trying his best Leighton impression, or whether Boedker did his best Patrick Kane impression. Either way, Mikkel Boedker scored the game-winning goal in overtime as the Phoenix Coyotes defeated the Chicago Blackhawks 3-2 in the third consecutive overtime thriller of this series. Thus far the series has had its’ share of overtime theatrics. Wednesday night, the overtime trend continued and was paired with much more physicality. It all started in the first period when Coyotes forward Raffi Torres laid a brutal hit on Blackhawks star forward, Marian Hossa. Hossa passed the puck when Torres took a run at him, while leaving his feet and targeting the head in the process. 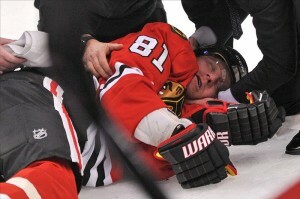 Hossa remained down on the ice and was taken off on a stretcher. You can watch the Torres hit on Hossa here. He was taken to the hospital for further examination, and was released after the game concluded. Torres did not receive a penalty on the play, much to the chagrin of Blackhawks Head Coach, Joel Quenneville. This isn’t the first time that Torres has taken out one of the Blackhawks key players. Exactly one year to the day, Torres, then with the Vancouver Canucks, laid a brutal hit on defenseman Brent Seabrook. Torres was not suspended for the hit, NHL Disciplinarian Brendan Shanahan thought differently about his hit on Hossa. Torres was suspended indefinitely for the hit, and his physicality and playoff experience will be missed by the Coyotes. Nonetheless, he deserved to be suspended. Chicago would answer, however. With a minute left in the first period, Andrew Brunette redirected a Patrick Kane shot past Mike Smith to give the Blackhawks a 1-0 lead. The goal was Brunette’s first playoff goal since 2008 with the Colorado Avalanche. The second period lacked scoring by both teams, but the physical play was on display once again. At the end of the second period, Jonathan Toews fired a shot at goaltender Mike Smith after the buzzer sounded. Coyotes defenseman Oliver Ekman-Larsson wasn’t particularly happy with the late shot. He shoved Toews and a scrum ensued, with Patrick Kane and Ekman-Larsson exchanging words. But the players were not the only ones that participated in the festivities. Blackhawks goaltender Corey Crawford skated to the opposite blue line and gave Smith an earful. It looked as if there might be a goalie brawl, but things subsided and the teams went to their respective dressing rooms. The third period displayed both teams growing disdain for one another, as they traded hits, and for a short time, some goals. Mikkel Boedker fed Rostislav Klesla at the top of the left circle, and he blasted a shot past Corey Crawford to even the score. Phoenix was beginning to establish some momentum. That momentum would not last long. Just 33 seconds later, Blackhawks forward Michael Frolik darted into the zone and backhanded a rebound past Smith as the ‘Hawks regained the lead. Frolik has been a healthy scratch since April 7 against Detroit, but was inserted into the lineup due to the 3 game suspension of ‘Hawks forward Andrew Shaw. 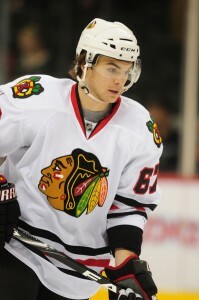 Frolik looked energized in his return and was one of the best Blackhawks on the ice. He finished the game playing 19:26 minutes with 4 shots and was a plus-1. It was the Coyotes’ turn to respond. Thirty-two seconds later, Klesla fired a shot that went off the skate of forward Daymond Langkow and bounced into the slot where Ray Whitney easily deposited the puck into the empty net. The overtime was somewhat of a track meet with both teams exchanging chances on both ends of the ice. The game was decided 13:15 into the overtime period when Boedker found the loose puck by the Blackhawks goal line, and fired a shot on Corey Crawford. The puck snuck between the legs of Crawford and into the net. The goal was very similar to the goal that Patrick Kane scored in Game 6 of the Stanley Cup Finals in 2010, except on this one, everyone knew the puck was in the net. The shot was should have been saved, and one that Crawford has to make. Crawford has not been terrible this series, but there is still room for improvement, especially with Mike Smith making big saves for Phoenix. Phoenix now holds a 2-1 series lead on Chicago in what is becoming a very physical series. Game 4 is tonight at 8 pm at the United Center.